A handy tool for keen gardeners is a lawn aerator, which stimulates the growth of grass for a healthier and more lush-looking turf. Aerating your lawn is sometimes thought of as the solution to rescuing a lawn that has stunted growth, and while this is true, gardening experts also recommend that lawns be aerated at least once annually for good maintenance. Once you have decided to give lawn aerating a try, you then face the tricky task of choosing a tool to help you achieve this. 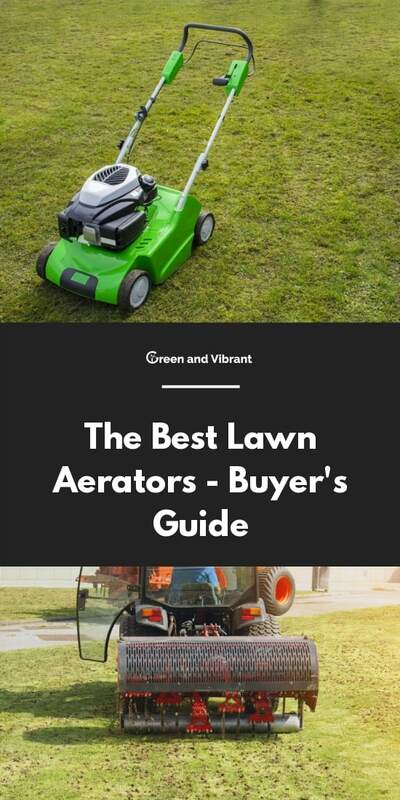 Our informative review will guide you through the best lawn aerators on the market and help you to understand which one will best suit your requirements. Here is why should you aerate your lawn and what should you look for in a lawn aerator? The action of aerating your lawn is essentially to make many holes in the soil, allowing water, air, and nutrients to penetrate deeper, and directly reach roots. Over time, the soil under your lawn can become compacted, and elements that roots need to thrive cannot reach them. Older lawns or lawns with high foot traffic will usually suffer from greater levels of compaction. Aeration is a way to manually combat the compaction, resulting in a healthier and lusher-looking lawn. Gardening experts recommend that lawns are aerated at least once annually as part of a good maintenance schedule, alongside fertilizing, weeding, and watering. You will be able to notice visually that an aerated lawn is thriving. The grass will appear thicker, be a more vibrant green, and look much healthier. Another advantage of lawn aeration is that it can make your money and efforts work harder for you. You may have found that you are spending hundreds of dollars a year on grass seed, fertilizer, and watering, only for your lawn to be still looking unhealthy. Aerating will allow your nutrients to directly reach grass roots where they have the greatest effect, giving you the biggest bang for your buck. If fertilizer cannot seep down through compacted soil, then you might be wasting time and money by using it. If you like to follow the recommendation of having your lawn aerated annually, then it may make sense to invest in an aerator and perform the job yourself. Landscaping and garden maintenance companies can charge in excess of hundreds of dollars to perform one lawn aeration, so even a more expensive aerator will have paid for itself with just one use. Once you have purchased an aerator, you can use it any time you wish, and as they are sturdy pieces of equipment, they should see you through many years if you look after them well. It’s also worth considering if you are likely to have time to aerate your lawn annually, and if you enjoy working on your garden. If the answer to either of these questions is no, then it may not be worth purchasing an aerator only to have it taking up space in your garage. Your circumstances will help to define which features you need from your aerator. If you have a large lot or own several plots of land, you will most likely want a larger piece of equipment to aerate your lawn. Gas-powered or tow-along aerators cover the most ground with minimal effort on behalf of the user. Owners of smaller lawns will likely require manual tools to aerate as users generally find that setting up large tow-along aerators is too much hassle to cover a small area. Tow-along aerators can also be difficult to maneuver in small spaces. Tow-along aerators will obviously need a vehicle to tow them, so look for a tow-along fixture that is compatible with your rig. Vehicles that can pull tow-behind aerators include lawn tractors, ATVs, and ride-on mowers. You will need to ensure you have a reliable means of transporting the tow-along too. In choosing an aerator, you need to decide if you would like to make indentations in your lawn, or if you would prefer to remove plugs of soil from your lawn. Some users argue that just spiking the lawn is ineffective, because the compacted soil has nowhere to go, and will only be further compacted in a different direction. Plugging, however, removes cores of soil, giving the lawn more room to breathe. That being said, many users of spike aerators find them to be incredibly effective, so it comes down to personal preference. One negative of plug aerators that users sometimes complain of is that the hollow spikes can become full of soil, and need to be emptied out before being plunged back into the ground. This can make a hard job even harder and is a problem that you will not encounter with spike aerators. Tools for manually aerating your lawn require significant levels of physical exertion. Users have found that spiked shoes are slightly less strenuous to operate than other manual aerators, such as spike or plug forks. Once you have the hang of walking in spiked shoes, you can wear them while mowing the lawn and do double duty. The manual aeration forks will give more of an all over body workout as you will also be engaging the arms and shoulders, so anyone with back problems may wish to steer clear of these. However, if you would like an aerator that removes plugs of soil from the ground, then you will need a plug aerator fork as spike shoes cannot perform this task. How you operate an aerator will be dependent on which type you select. However, the preparation you put into your yard before you aerate is the same for whichever tool you use. Having ideal conditions to aerate will make all the difference to the success of your operation. Poor ground conditions can render your aeration completely useless and even damage your tools. To prepare for aerating, mow your lawn as low as possible, ideally the day before you aerate. The ideal conditions for aerating your lawn are for the soil to be moist. If the ground is too wet, the tools will not work properly, and it will be a messy job. Wet soil will cause the holes you have made to close up, and air and water will not be able to get through (Grass Clippings). If the soil is too dry, this will also be a problem. Using tools will be much harder on dry soil, and using an aerator in these conditions can cause your soil to crack. To achieve ideal soil moisture, you can aerate a day or two after moderate rainfall, or you can manually water your lawn in the days leading up to aeration. Here are the five best lawn aerators we’ve found. The Agri-Fab Tow Plug Aerator and the Brinly Tow Behind Aerator are very similar in design with the Agri-Fab being slightly more robust. The Agri-Fab is eight inches wider than the Brinly and has 25 pounds more weight capacity. Users have found both of these tow along aerators to have a lengthy assembly time, but for the most part, it has been worth the hassle as they both perform well once constructed. The Agri-Fab comes with a three-year warranty compared with the Brinly’s two-year warranty. The Greenworks Dethatcher performs a slightly different job than the other aerators, though with the same ultimate goal of improving lawn health and appearance. The dethatcher removes any thatch or dead grass on the surface of your lawn, which can prevent light, air, and nutrients reaching the grass underneath, stunting its growth. The dethatcher does not create holes in the soil as the other aerators do, but can agitate soil enough to encourage new growth. Although the dethatcher may not seem as intensive as the aerator options, its users have mostly been very impressed with the results it gives and the ease with which it works. The two Yard Butler tools and the Abcosport spiked shoes all require similar levels of manual labor and give similar results. Users recommend them for smaller lawns as they are fairly time-consuming and involve a lot of effort to use while the tow-along aerators would better suit large spaces. The spiked shoes can be used while you mow the lawn, enabling greater productivity than the Yard Butler aerators. This tow-along plug aerator from Agri-Fab is 48 inches wide and has 32 galvanized knives that pull up plugs of soil from your lawn. It has a particularly sturdy weight tray that can hold up to 175 pounds of added weight, aiding in even deeper soil penetration. Users love the ease with which they can aerate their land and the relatively short length of time it takes to complete the job. It is a solid piece of equipment, proudly made in the USA. Regarding versatility, it can be towed by numerous vehicles, including tractors, ride-on mowers, and ATVs. The vast majority of users who purchased this aerator have been pleased with how durable it is and note that it is all heavy metal except the wheels. The general consensus is that it handles well and does the job it was intended for with ease. The main complaint that most of the users made was about the build time. This aerator will likely take around two hours to construct and comes in more pieces than you would expect. You will need a variety of tools to fix it all together and a fair bit of patience! Users advise wearing specialist gloves to build the aerator because the knives are incredibly sharp and can easily slice through denim. In spite of the complex build, users have been mostly impressed with this piece of machinery, and it is highly recommended as an alternative to hiring an aerator annually or paying for a garden company to aerate for you. This four-spike aerator from Yard Butler is a heavy duty fork that will loosen thatch and soil from your lawn, giving the roots access to the air, water, and nutrients they need to produce a thriving garden. The three-inch spikes work in various conditions, including rocky lawns, sticky soil, and highly compacted ground. Yard Butler offers a lifetime warranty with this spike aerator, guaranteeing it against any material or manufacturing defects. Users of this tool all tend to agree that it requires hard work to use successfully. Aerating your whole garden will be a labor-intensive task and will likely take several hours even for a small-sized lawn. That being said, it is very reasonably priced, so it’s a good alternative to more expensive aerators if you don’t mind putting in a bit of muscle and don’t have a large space to work on. Spike aeration is recommended by users for mild maintenance lawn compaction. If your lawn needs more severe attention, you may be better off with an aerator that plugs the ground. This handheld aerator is the plugging version of the Yard Butler spike aerator. It features two 3.5 inch hollow spikes with which you can manually plug cores from your lawn. The tool is 37 inches long, a height designed to reduce back strain and comes with a leverage foot bar. Users love the value for money of this aerator but recommend it for small lawns only. Similar to the Yard Butler spike aerator, the vast majority of users of this tool comment on how much physical exertion is required to use it. Some users recommend doing your garden in sections and spreading the work out over several days or weeks to avoid strain or injury. The recommendation that comes up, again and again, is that this tool is significantly more effective if you use it the day after a moderate rainfall or put a sprinkler system on your lawn. In spite of the effort required, this tool is hailed as a durable and cost-effective solution to lawn aeration. Some users did complain that the hollow spikes became easily clogged with the soil plugs during use, which rendered the tool useless. This issue seems to be dependent on the type of soil you are working on and may be less of a problem with a moist lawn. The 14-inch wide, 10-Amp electric dethatcher from Greenworks benefits from an adjustable handle with padded grip for added user comfort while you remove the thatch from your lawn. It also has an adjustable tine depth of three positions for added control as well as stainless steel tines for extra durability. The dethatcher comes with a full set of replacement tines, though users have commented at how pleasantly surprised they have been with the longevity of the tines, so you shouldn’t need to use the replacements any time soon. As this is a corded tool, you will need to purchase a heavy-duty power extension cable to use in your yard. Inferior extension cords will result in poor power and the device overheating. Users of this dethatcher have been impressed with its effectiveness and ease of use. Though not self-propelled, it pushes along effortlessly and has a zero-carbon footprint. Users comment that this dethatcher greatly improves the health and appearance of their lawn with very little time or work involved. It comes highly recommended for anyone wanting to improve the state of their larger lawn. This 40-inch wide tow-along aerator from Brinly features 24 heat-treated steel spoons that penetrate the ground and remove three-inch plugs of compacted soil. Each spoon is attached individually, which some users complained made the assembly take too long. The benefit of this, however, is that a spoon can be easily and inexpensively replaced if it breaks. The aerator will require weights added to the enclosed steel tray to plug to a satisfying depth. The tray has a load capacity of 150 pounds. Users of this piece of equipment have been impressed with how well it operates. The tines do not get clogged up with plugs during use as some other aerators do and it has a solid build quality that should last many years. It is a much more cost-effective method of aerating your land than repeatedly renting an aerator or paying a landscape company to do the work for you. As this is a tow-behind piece of machinery, you will, of course, require a lawn tractor or other suitable vehicle to pull it along. Users note that it handles well as long as you don’t need to turn too many corners, and you should not attempt to reverse. One big disappointment with this product was that many users found that the item arrived with various components missing. While Brinly customer service was quick to send out replacement parts, it does cause a delay in using the aerator, which could be inconvenient. The main complaint about this aerator was the length of time it took to assemble. These plastic-soled aerator shoes work by strapping on top of your own shoes and making holes in your lawn as you walk. Each shoe has thirteen 48mm spikes on the base and three straps across the top that are secured with metal buckles. All metal components of the shoes are designed to be durable and anti-corrosive for longevity. These are generally very popular with users because they allow you to multitask, aerating the yard with your shoes while you mow the lawn. User reviews of this product are predominantly positive. They are reasonably priced, sturdy, effective, and very easy to use. Assembly is easy, and a wrench is supplied with the purchase, so no extra tools are needed. However, some users did note that no instructions were supplied, so they had to follow online videos for assembly advice. Users commented that the shoes also provide an energetic workout, which could be a positive or negative feature depending on your viewpoint! Similarly to the Yard Butler tools, these aerators require more time and effort than a tow-along or corded alternative, and so would be recommended only for smaller lawns. In comparing these top-performing lawn aerators, the Agri-Fab stands out as the clear winner. It is large and robust, able to aerate a large space in a short amount of time. Its quality build means it should see you through for years to come. It also benefits from the longest warranty, a sure sign that the manufacturers believe in their product and that it was built to last. However, if you have a smaller-sized lawn, then a manual aerator will likely be more beneficial. Of these manual aerators, the Abcosport Lawn Aerator Spike Shoes fare better in user reviews. The shoes are affordable and can be worn while mowing your lawn for greater efficiency. If you want to remove plugs manually, however, the Yard Butler ID-6C Plug Aerator is your best bet.